Thanks to all who have been following this blog! 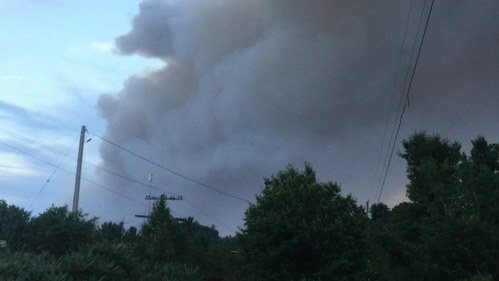 Follow CBC Sudbury on Facebook or Twitter, tune in to the radio or find us online at www.cbc.ca/sudbury for more updates on the forest fire situation in northeastern Ontario as it develops. Stay safe everyone! Evacuation orders for Henvey Inlet First Nation, home to about 200 people, will remain in place until at least next Friday (August 3). 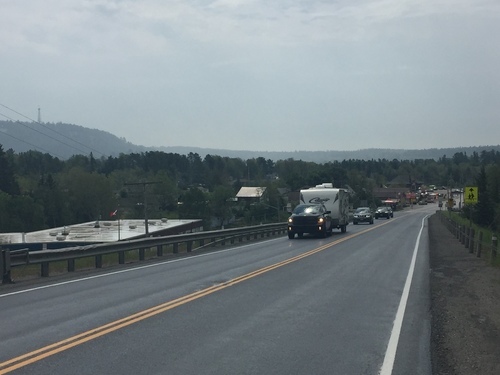 Killarney councillor and emergency manager Jim Rook says the orders are likely to be similarly extended for the Key, Pickerel and French rivers west of Highway 69. Rook says people in the area are anxious to get back to their homes and cottages, but that firefighters still have work to do. "It will be a fair time, I think, before we're all happy with [the situation],” says Rook. “But they've put all kinds of resources at it, which is great." 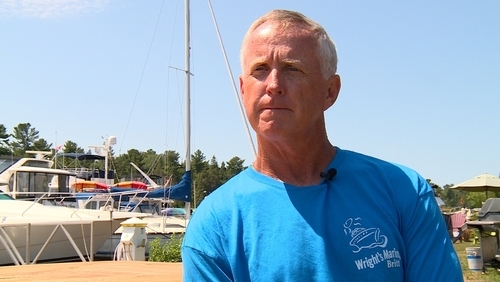 Graham Lacey of Wright’s Marina in Britt notes his community of around 300 people has been a lot busier since the MNRF set up its temporary firefighting headquarters nearby — but otherwise, life has gone on. Lacey adds it's bringing the best out of the community, as countless locals have offered to house and feed the workers who’ve arrived in the area. What goes into a “48-hour kit” of food, like the ones sent to forest firefighters in Britt? Parry Sound grocery store owner Matthew Derouin explains. A total of 34 kits were sent out yesterday. That's equal to two days' worth of food for 136 frontline workers. 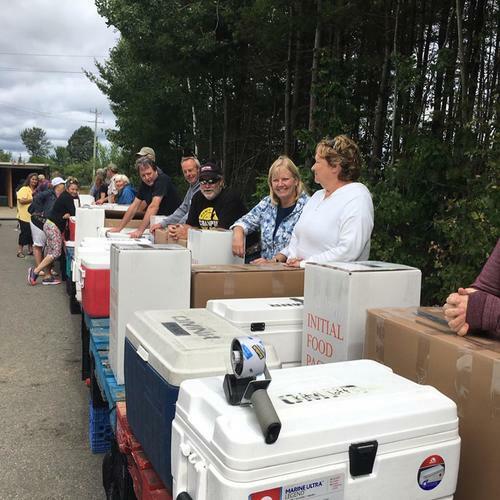 Parry Sound area volunteers have stepped up to help get food to firefighters battling a nearby fire. 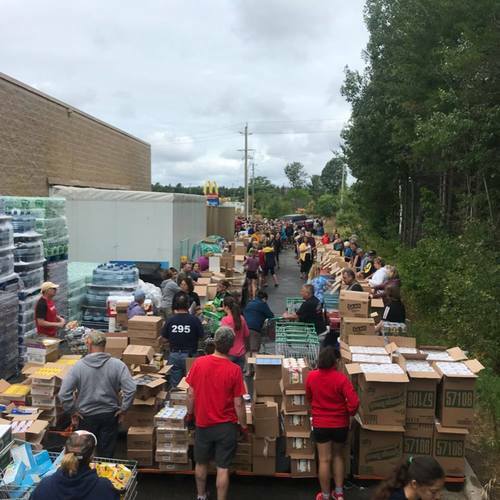 The MNRF contracted a food order for firefighters from the Sobeys in Parry Sound. With the crews arriving in Britt on Friday night, store owner Matthew Derouin needed extra hands to help pack the goods and ship them out early Saturday. Derouin put out a call on social media and was expecting around 50 volunteers to show up. He adds the initial order totalled over $20,000. Here's what the MNRF's forest fire base camp in Britt looks like. Photos shared this afternoon by Radio-Canada's Jean-Loup Doudard (@jldoudard). Finlayson Point Provincial Park in Temagami is set to re-open on Monday, according to the Ontario Parks website. 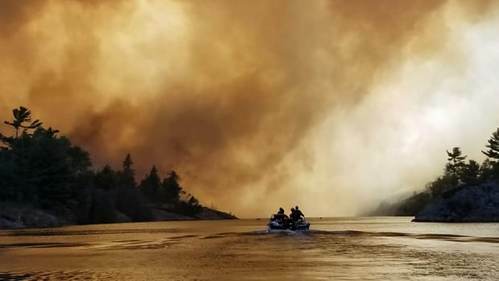 Marten River Provincial Park, about 40 kilometres south, is supposed to follow suit on Wednesday. 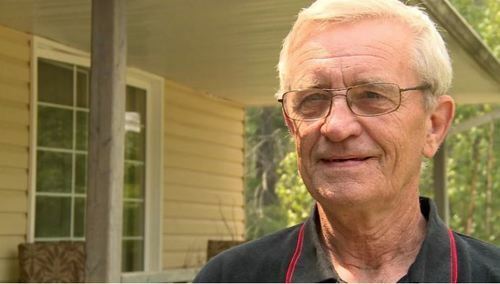 Jim Rook, the municipality of Killarney’s emergency manager, says he’ll be visiting the ministry’s temporary firefighting headquarters in Britt on Monday. 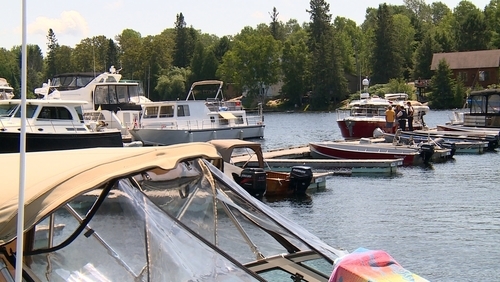 Evacuation orders for the Key and Pickerel river areas remain in place. “It appears that MNRF has had a successful day with suppression and continual water bomber and helicopter attacks have made headway. On the southern side [Key] area, crews are mopping up hot spots,” stated Rook. Great photos from the CBC's Chris Ensing, who is reporting from the forest fire base camp in Britt today. Just spoke to the MNRF’s northeast fire information officer, Shayne McCool, regarding the new 8,224-hectare size of Parry Sound 33. McCool says otherwise, not much has changed since last night. He says the fire is still about 7 km from Highway 69, and that firefighters are working to keep it that way today. 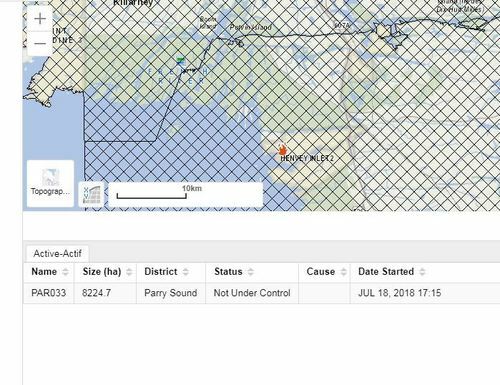 Ontario's forest fire information map shows Parry Sound 33 now measures 8,224 hectares — up from 7,651 reported last night. 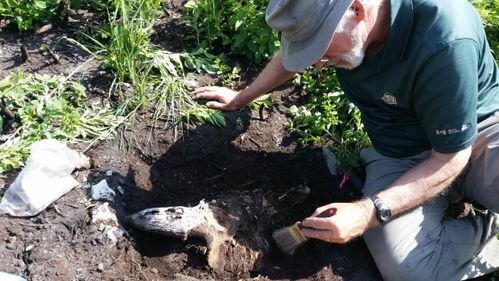 A fire damaged Alberta's iconic Waterton National Park in 2017, but also cleared so much vegetation that archaeologists have been able learn more about what life was like for the area's Blackfoot people there some 300 years ago and longer. Hello on this Sunday morning. The latest from the Ministry of Natural Resources and Forestry is that no new fires were spotted Saturday overnight into today, but crews continue to battle 39 active forest fires across northeastern Ontario, with 12 out of control. Parry Sound 33 is still at about 7,650 hectares in size. Winds blowing northeast will keep crews busy along the portion closest to Highway 69. The ministry said the fire was about seven kilometres from the highway late last night. The Ministry of Labour and OPP are leading the investigation into the firefighter's death near Red Lake. CBCThe Ontario government is investigating the death of an Alberta firefighter near Red Lake, Ont. The four-person crew arrived in Northern Ontario on July 13 and were stationed near North Bay. They returned home on Friday. CBCAdam Green, stationed in Labrador, and a four-man crew made up of Newfoundlanders and Labradorians helped fight the forest fires in North Bay. The situation is being described as "very stable." 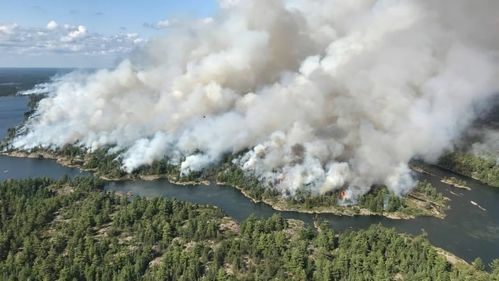 CBCA long-time councillor for the Municipality of Killarney says northern Ontario cottagers are breathing a sigh of relief as Parry Sound 33, a 7,651-hectare fire which has already forced the evacuation of Key Harbour and Henvey Inlet, has temporarily stopped spreading in the area. Horwath also tweeted on Friday that she was "Devastated to learn that an Alberta wildland firefighter has died while battling wildfires in Northwestern Ontario. 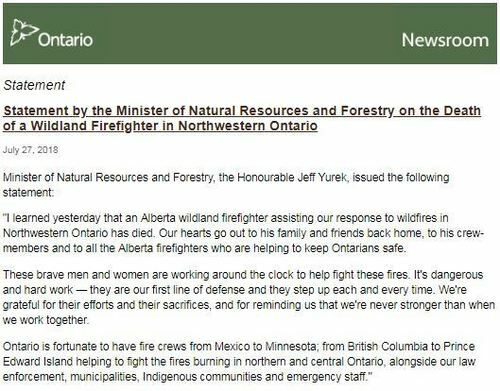 My thoughts are with his family, friends and the people of Alberta tonight, as well as the many others still fighting these fires across Ontario." 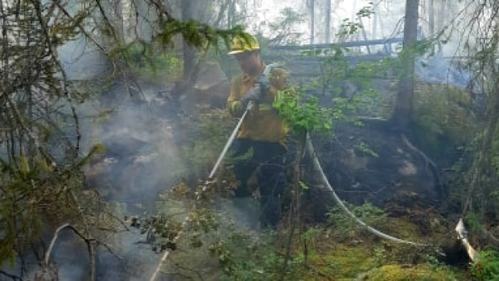 It's been a very busy season for forest fire fighters in Northwestern Ontario. 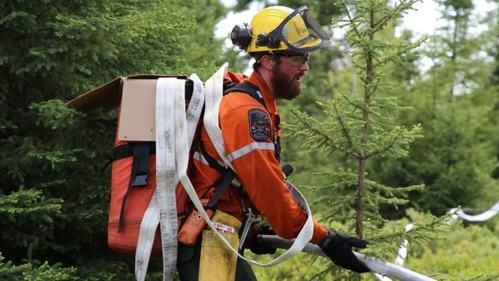 CBCIt's been a massive forest fire season across Ontario, with more than 800 fires identified throughout the summer season and 400 of those fires burning in the northwest alone. Firefighting resources, property damage - wildfires can be costly. When a wildfire is started by people or industry, why is it so difficult to recoup those costs? CBCEven if the province were to determine the activities of a private company accidentally ignited a wildfire that's destroyed forests and homes on the northeastern shore of Georgian Bay, there's no guarantee the company would have to pay for any damage or firefighting expenses. Crews at the fire command centre in Britt had an unexpected visitor yesterday. Premier Doug Ford stopped by to thank firefighters who are assisting in the battle against Parry Sound 33. 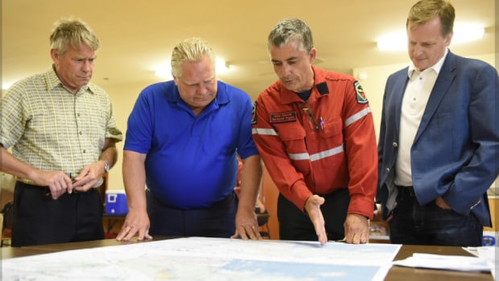 CBCPremier Doug Ford was in Britt, Ont., Friday afternoon to visit the command centre set up for emergency personnel working to supress the forest fire known as Parry Sound 33, south of Sudbury. 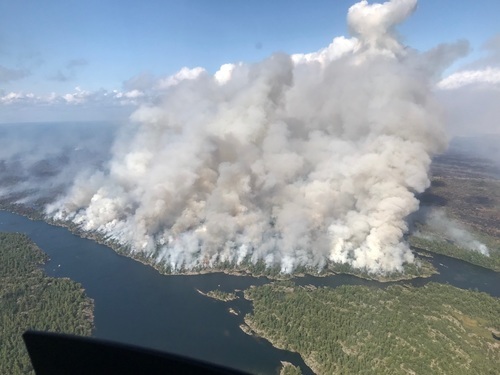 The latest update from the Ministry says that the northeast corner of the Parry Sound fire is creeping closer to Highway 69. Crews will focus their efforts in that area today. 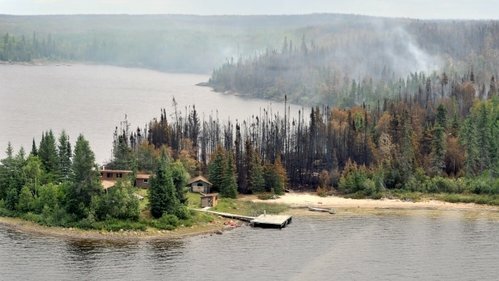 CBCIn a written statement late Friday night, the Ministry of Natural Resources and Forestry said water bombers continue to bucket the growing north-east portion of the 7,207- hectare blaze, which burns approximately seven kilometres west of of the highway and three kilometres south of the Pickerel River. 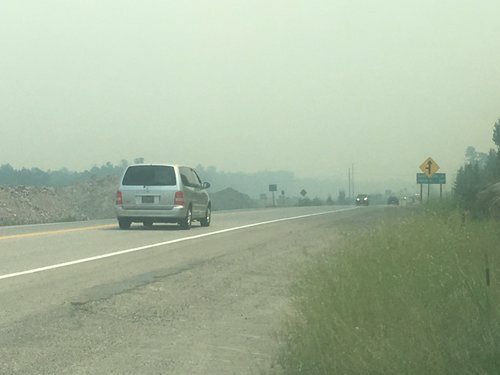 Smoke continues to be a concern for the communities along Highway 69, the main corridor between Toronto and Sudbury. Ministry officials says smoke is being reported from as far away as Quebec. CBC reporter Chris Ensing took this photo from Grundy Lake, approximately 90 km south of Sudbury yesterday. According the the MNRF, there are currently 43 active forest fires across the northeast. Of these, 13 are not yet under control, 30 are either being held, under control or being observed. That includes Parry Sound 33, which the Ministry says is just over 7,000 hectares. Sad news out of the northwest. An Alberta firefighter died while battling a blaze in Red Lake, Ontario. You can read more about that in the story below. CBCAn Alberta firefighter has died while fighting forest fires in Ontario. Premier Rachel Notley offered condolences following the death of Jerry Gadwa from the Kehewin Cree First Nation reserve. Good morning from CBC News in Sudbury. We've been following the forest fire situation across Ontario. 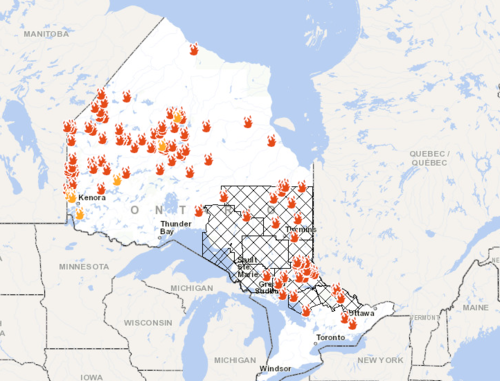 Here's a map of what's currently burning across the province. You can view an interactive fire map from the Ministry of Natural Resources and Forestry here.